This bold undertaking covers Western theatre from ancient Greece to the present day. It traces the development of dramatic art through the miracle plays, the great Shakespearean period, MoliÃ¨re and Racine in France, Goethe in Germany, through the nineteenth century and the main movements in the twentieth century. It is illustrated by numerous examples of differing styles, with some historical recordings as well and excerpts from nearly fifty plays - a fascinating journey. 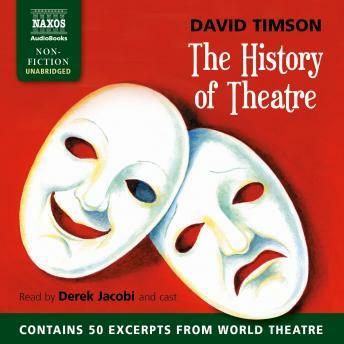 It is written by David Timson, the British actor and director who features extensively on Naxos AudioBooks in both roles.